Henry Christopher Wise was the eldest son of Henry Christopher and Henrietta Wise of Woodcote, England. I am very sorry to have to record the death of Captain Wise, which took place this morning. This event has created a most painful sensation among the deceased's fellow officers, by whom, as by his men, Captain Wise was held in the highest esteem and affection. The wound from which this young officer has died did not appear a dangerous one, and it was not till within forty-eight hours of his death that unfavorable symptoms appeared. During that period he rapidly sank. His death is another sad illustration of the evils which result from intestine disturbance. I hope it may be the last fatal result of the sad Sabbath morn, though I fear there are yet some whose injuries received that day threaten an unfavorable issue. Poor Hasleham is in a very precarious state. 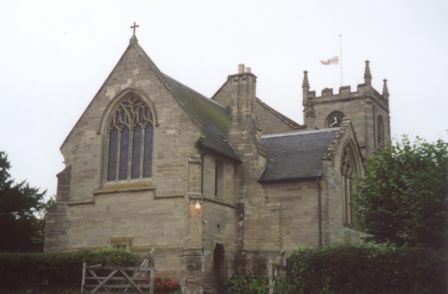 Captain Wise expressed a wish that Sir Charles Hotham should be consulted as to the place and mode of his interment. I am informed that Captain Wise's fellow officers and men are all deeply distressed by his untimely death. Next mail will carry home to England intelligence which will sadden many a circle of the friends of those who have fallen, or been mutilated for life, in this unnatural warfare. One can image the sickening revulsion of feeling with which the people of England will read — perhaps on the same page which records a victory in the Baltic, or in the East — of the encounter at the Eureka stockade, and its sad results, and the blame which they will attach to all who are chargeable with irritating the people to the point of revolt, or stimulating them to its commission. I am unwilling to express an unfavorable opinion of the conduct of men who may yet have to answer for their conduct before the tribunals of their country. But amid the melancholy souvenirs of Ballaarat, it is impossible to arrest one's thoughts among the details of the insurrectionary movement, and not to inquire as to its causes. These, so far as they related to the laws in force on the goldfield, and the mode of their administration, I have already referred to. The more immediate causes are to be found in the violent and exciting language employed by some of the popular agitators, and the fool-hardy license-hunting expedition of Thursday. I believe that nearly all of these agitators were sincere in their determination to seek constitutional reforms by constitutional means only, and that they bitterly regret that recourse should have been had to arms. Some of them withdrew immediately on the determination to appeal to force, and exerted themselves, at the peril of their lives, to avert the threatened danger. Others, I believe, refrained from withdrawing from the movement, even after it had assumed its unexpectedly violent aspect, from the hope, that if they could not avert the insurrection, they might guide and modify it; and from a mistaken pride which forbade them to shun dangers they had themselves, in some degree, provoked. The movement divides itself into two entirely different parts, and is but a sadder and more tragic version of the same series of events as that which presents itself in the burning of Bentley's Hotel. The people who assembled to express their opinion as to Bentley's acquittal had no intention of proceeding to the extremity of setting fire to his house. The speakers gave expression to the sentiments of the assembled multitude, perhaps in stronger language than is usual at political meetings in England, but in language which did not seriously exaggerate the feelings of the assembly. It is plain that neither the speakers nor the great body of the audience had any purpose of committing the act of violence in which the meeting terminated; yet the issue was such as need not have been matter of surprise to those who know the character of the different components of the Ballaarat population, and the, at the time, unprecedented excitement to which they had been wrought up. The organisation of the Reform League was an entirely constitutional movement. I believe that many of the prominent members of that association were as purely patriotic in their aims, and as constitutional in the means by which they sought to secure them, as some of the present Ministry in their reform agitation a quarter of a century ago, or as the members of the Anti-Corn Law League in more recent times. Strong language was used on the platform at the public meetings, but I have heard very strong language used by very loyal gentlemen at anti-convict meetings, without any suspicion of their loyalty being thereby excited. Several circumstances have combined to give to the strong language used at these meetings a significance which otherwise it would not have had. The people were roused and excited to an unprecedented degree. There were among them several foreigners, who gave to the expressions employed a latitude of meaning they were not intended to bear, and would not have borne, to the minds of Englishmen. I have felt surprise at the repeated denials of the complicity of foreigners in this movement. I am convinced from what I have seen here that this class was identified with the second phase of the movement, with the physical force demonstration, to a greater extent than their numerical relation to the rest of the population would warrant. The agitation was not commenced by foreigners. And here I would say I use the word in no invidious sense; it is the only word which will describe the class to whom I refer, and in whose traditional feeling, and ignorance of British customs, there was found the reason of the ready appeal to arms. No one can doubt but that the relation of many of the European populations towards the Government under which they live is entirely different from that subsisting between the Government of the United Kingdom and the people; that there is language used daily in England, with reference to the Government of the country, which could not be used with safety in many of the European States, which, if used there would certainly expose the imprudent speaker to imminent danger, and which, consequently, is only employed by these who are prepared to encounter the peril, who are confident of success, or indifferent as to defeat. Even our kinsmen from America stand in a different relation to the existing Government of their country from that to which the people of the United Kingdom are accustomed. It cannot to denied that the people of the States do now and again assert democracy in its simplest form, supersede the functions of the Executive Government, and reclaim for a time the trust they have committed to it in away which British subjects are not accustomed to. Such temporary resumption by the people of the power which they are contented, ordinarily, to leave in the hands of the Executive has not the same moral aspect to a citizen of United States that it has to a citizen of Great Britain. The one can on an emergency readily assume, and when the occasion has passed away, abandon, a position which the other could only take in extremity, and could not subsequently, without success, gracefully abandon. The citizen of the United States asserts his citizenship ac- cording to the theory of government under which he lives, by the same act which would, under the British constitution, be an abrogation of citizenship. It is thus I explain to myself the measure in which others than British subjects, to avoid the epithet " foreigners," to which exception has been made, have taken part in the recent movement on Ballaarat, and in its melancholy sequel especially. Neither movement-for there are two, and they are not in the relation to each other, save indirectly of cause and effect the meeting at Bentley's Hotel was one thing, and the burning of the hotel another: the reform agitation was one thing, and the insurrection in arms another, neither of the two latter movements was originated by foreigners, nor are they as a class to be held responsible, but that they were prominent in the matter in a greater degree than their numbers would account for I cannot help believing. Among the parties examined at the police court here, I was struck with the large proportion of foreign names. Every one speaks of the three hundred German rifles under the immediate command of Colonel Vern, and surely of a force of less than seven hundred men. This is a large proportion. The latter number is above the estimate made by the leaders themselves of the insurgent force, and even if they as body of rifle men were not quite three hundred, and were not all Germans, the fact that the party so designated and commanded as I have said is constantly referred to as having been the best armed, drilled, and generally the most efficient part of the insurgent force, certainly warrants the statement that a number of our fellow-colonists, who are not British subjects, are chargeable with complicity in the insurrectionary movement. The circumstances I have already referred to are those in which I explain their prominence, without my being compelled to regard them as more culpable than others of the Reform League. I am sorry that the childish and cowardly custom of "Joeing still continues. A small party of the 40th on their march to-day were thus insulted, and I know that this, in connection with Captain Wises's death, has produced resentful feelings on the part of the soldiers. This may seem trifling matter, but it is no trifle, whatever it may be in itself, which tends to excite or keep alive in the breasts of one section of the British people resentment towards another. I enclose the semi-official record of todays' proceedings of the Commission. The process of the inquiry is watched by three representatives of the people of Ballaarat, and by four or five representatives of the press, who, in this case at least, may regard themselves as the representatives of the people of Victoria. This proceedings of the Gold-fields Commission of Inquiry were resumed this morning. Several witnesses were examined and much information was elicited as to the practical mode of working claims, and many useful suggestions concerning "shepherding" and deep sinkings. The evidence of Jonas Woodhead and Henry Lyle brought out many useful hints, and showed a thorough practical acquaintance with the intricacies of the mining interests. Mr Wandlass represented the feelings of the miners as to the employment of capital and the applicability of machinery. Mr Wood tendered his views with regard to hawkers licenses and Mr Grey, an honest and straightforward Scotchman, evinced a strong appreciation of political rights. The Chairman said he would wish that the subjects at present under discussion should terminate on Saturday and that on Tuesday the Commissioner would go into the evidence that had reference to the late unfortunate outbreak. It was intimated that Drs. Kenworthy and Otway had been written to to-day in order to obtain their presence as witnesses. The Funeral of Captain Wise, which took place on Friday forenoon at eleven o'clock a.m., being attended by nearly all the military force here, the Camp authorities, a number of police, and a numerous party of the residents in the locality presented an impressive scene[?]. The Commission of Inquiry adjourned their session, and were all present at the ceremony. Captain Wise appears to have been universally esteemed. Representations of his worth and amiability, and of the extraordinary influence which, through these qualities, he exercised on the men under his command on the pensioners in particular, meet me in every quarter. I have felt it my duty to at- tend the funeral of those ten who have died in consequence of the melancholy affair of the 3rd December; and equally in the case of Captain Wise and poor Powell have I felt the bitterest regret that life should have been so sacrificed, that the colony and the world should have been in so sad a manner deprived of two men in the pride and promise of their youth. On Friday afternoon, a man, who had been arrested on the charge of robbery was rescued from the police. A pretty numerous party gathered round the two officers who had the man in charge, and after asking the reason for his arrest, and for a sight of the warrant for his apprehension, jostled the officers and enabled the prisoner to make his escape. I am informed that the parties active in the rescue are well-known "immigrants from Tasmania," and the fact that they should feel themselves emboldened to at- tempt an act so daring, and should succeed in it, within sight of the Camp, and in the midst of a population whose interest requires so imperatively that robberies should be punished, indicates the false relation into which the people and the police of this gold-field have been brought by recent events. A memorial to the Lieutenant-Governor, praying for the commutation of the severe sentence passed upon Lang and Drake, has been already numerously signed, and will, doubtless, be still more extensively subscribed to in a few days. The signatures are those of merchants, store- keepers, &c., who were in the habit of transacting business with the Bank of New South Wales. There is one feeling universal here on the subject. It is admitted that, in the management of the affairs of the bank, there has been great and very culpable carelessness ; but it is believed that Lang and Drake are chargeable with no greater criminality than this, and the sentence passed on them is felt to be unduly severe, and likely to prove little short of that of capital punishment. The Commission of Inquiry continue their sittings from day to day. To-morrow will, of course, be a holiday. On Tuesday it is intended to receive the evidence bearing on the recent out- break. On Wednesday the Commission proceed to Creswick's Creek, and on the close of their labors there, which are not expected to prove of long duration, they will prosecute their tour. I anticipate a very valuable report as the result of the labors of this Commission. Their inquiries have been extended over a field of considerable latitude and have elicited valuable information on many points in the management at the gold-fields which may be expected to form the basis of future legislation. Besides the points of more immediate interest, such as the license-fee, representation, the administration of law, and the management of the police force, the question of "claims," partnerships, the result of the operation of machinery, and the effect of the introduction of capital, have been fully discussed. On these points — on that of administering the law by local tribunals — on that of the value and extent of the auriferous quartz-much important information has been gained. There appears to be every disposition on the part of the people to facilitate the inquiry; and a confident expectation is entertained that its result will be eminently beneficial. No one can witness the labors of the Commission, as I have been permitted to do, without being impressed equally with a sense of the importance and intricacy of the questions they are called to consider, and of their earnestness and zeal in seeking the solution of them. The festive, season of Christmas claims its observance even amid the depression and gloom which to a considerable extent pervade Ballaarat. The Queen's Theatre reopened last night, having been for a short time closed for enlargement and improvement. The enterprising managers of this establishment appear to enjoy amply the public appreciation, and to spare no efforts to merit it. The races of Tuesday and Wednesday are a topic of general interest. I enclose the abstract of the proceedings of the Commission on Saturday. Report of the Goldfields Commission of Inquiry, Saturday, Dec. 23rd. — To-day's proceedings brought to a termination the evidence elicited on the three first points of inquiry, according to the previously-stated plan or operation. A very considerable amount of useful, practical, and impartial evidence has been collected with reference to the laws and regulations, now in force on the gold-fields ; the operations of the same; and on the effects of political rights. Twelve witnesses were examined to-day, nearly all of whom contributed their quota to the already large stock of evidence, and from whom many hints were gathered, and much useful matter which might serve to form a basis for a mere solid and commodious superstructure of legal reform on the gold-fields. The evidence of Dr. Otway tended to show the immense extent of the auriferous lands in the colony, and how vast were the openings for the enterprising miner. The most valuable parts of his evidence were his own practical experience and decided views of the applicability of machinery to quartz-crushing, as well as of the means to be adopted for bringing to certain localities, hitherto unworked from the deficiency of water, a certain and never-failing supply. Mr. Hackettt, S.M., Mr. Johnston, Assistant Commissioner, and Dr. Kenworthy gave practical testimony, which will prove highly useful to the Commission. There will be no sitting on Monday; but the inquiry will be resumed on Tuesday, which will be devoted to hearing complaints affecting the officials in the different Government departments. On Wednesday the Commission will proceed to Creswick's Creek on Friday and Saturday it will sit at Castlemaine; and on the following Monday, Tuesday, and Wednesday at Bendigo. RELIC OF EUREKA. - CAPTAIN WISE'S SWORD. - BALLARAT Thursday. Mr. H. Barnett, of Ballarat East, has presented to the Fine Art Gallery, the sword said to have been carried by Captain Wise, who led the military forces in the attack on the Eureka Stockade on the morning of Sunday, December 3, 1854, and who was fatally wounded during the progress of hostilities. 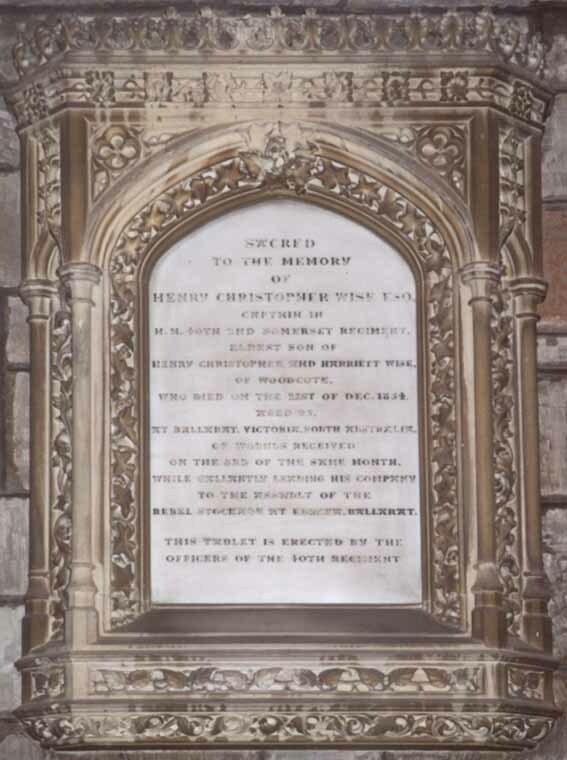 "Sacred to the memory of Henry Christopher Wise Esq, captain in H.M. 40th 2nd Somerset Regiment. 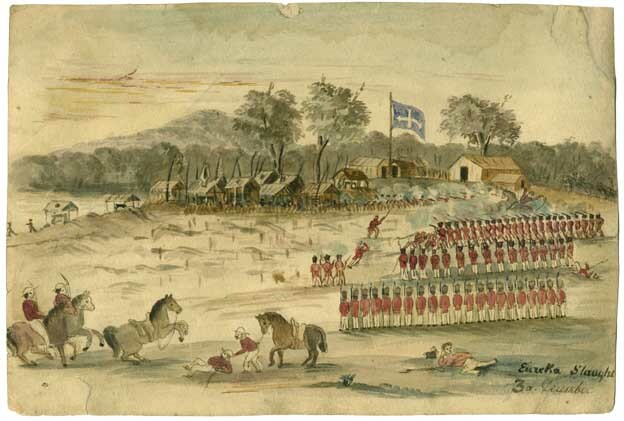 Eldest son of Henry Christopher and Harriett Wise of Woodcote, who died on the 21st of December 1854 at Mt Ballarat, Victoria, South Australia, of wounds received on the third of the same month, while gallantly leading his company to the assembly of the rebel stockade at Eureka, Ballarat. 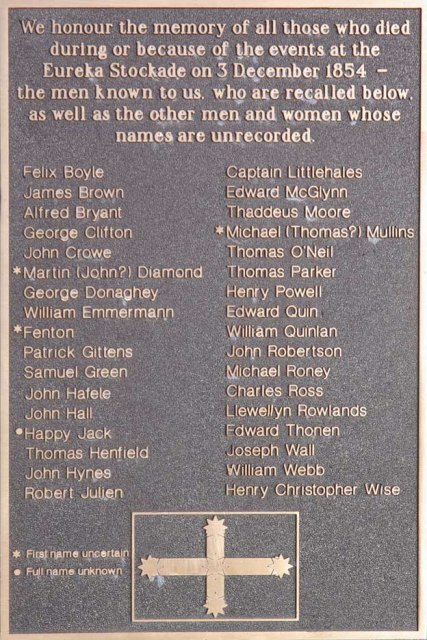 This tablet is erected by the officers of the 40th Regiment." Captain Wise of the 40th was buried today with military honours. It was an ignoble cause for a British Officer to fall in and there is no doubt the recollection of the horrible scene added some bitterness to his dying moments He was highly respected by his brother officers & almost idolized by his men. ↑ McFarlane, Ian, "Eureka from the Official Records", Public Record Office Victoria, 1995. ↑ The Argus, 26 December 1854. ↑ The Argus, 22 December 1911. ↑ Diary of Charles Evans, State Library of Victoria, MS13518. ↑ Kalgoorlie Western Argus, 6 December 1904. This page was last edited on 16 April 2018, at 11:48.